Do you love cheesecake but avoid making it due to the calories? If you’re looking for a healthier dessert for a special occasion, this cheesecake is lighter but with all the taste! Cheesecake is one of our favourite desserts but being on the Mediterranean Diet, for a few months now, I didn’t want to make something loaded with calories so I adapted an older recipe and made this “no guilt” Apricot Cheesecake. Being on a diet, I haven’t made a real dessert for ages, so I have really been looking forward to making a cake for my husband’s birthday, which is today. I decided to recreate an older cheesecake I made in the early stages of blogging by reducing the calories significantly. I calculated the calories based on the ingredients used in the aforementioned cheesecake. I had used an 8″ (20 cm) baking tin and divided it into 12 pieces and was shocked to find that each piece had about 600 calories? That’s almost as many calories as a regular meal!!!! First of all I substituted the fatty ingredients with low fat products: Digestive light biscuits, Philadelphia light cream cheese, anthotyro which in any case is a Greek low fat cheese, similar to ricotta and Greek yoghurt with no fat at all. Instead of regular chocolate, I used dark chocolate with 70% cocoa, which is much healthier; in fact this chocolate in Greek is called Health Chocolate. Instead of butter I used tahini with honey and just a little bit of butter and finally I used less eggs to bind the cream. I used a cup of the apricot spoon sweet I made last week and that is the only sweetener I added in the cake, plus the one used to make the jelly and decorate the cake on top. I estimated that this cake, using an 11″ baking tin and again dividing the cake into 12 pieces (see how big the piece is in the picture) gave around 330 calories. However, I had to estimate the calories on apricot jam instead of spoon sweet and ricotta cheese instead of anthotyro. I am not 100% sure if my calculations are accurate but nonetheless, at least the ingredients used are much healthier than the original recipe. The result was a rich, velvety, traditional New York cheesecake with all the decadent flavour of the full-fat version. I hope that this event I have created to honour Rosie, will inspire some other people to think about their health as well and make wise decisions on what to eat and what not to eat. Coronary artery disease (CAD), also called coronary heart disease, is a condition in which plaque (plak) builds up inside the coronary arteries. These arteries supply your heart muscle with oxygen-rich blood. Plaque is made up of fat, cholesterol (ko-LES-ter-ol), calcium, and other substances found in the blood. When plaque builds up in the arteries, the condition is called atherosclerosis (ATH-er-o-skler-O-sis). Most heart attacks occur as a result of coronary artery disease (CAD). CAD is the buildup over time of a material called plaque on the inner walls of the coronary arteries. Eventually, a section of plaque can break open, causing a blood clot to form at the site. A heart attack occurs if the clot becomes large enough to cut off most or all of the blood flow through the artery. I must tell you that this cheesecake tasted wonderful. If you like tahini, believe me the crust had a wonderful taste and the cheesecake itself was even better. First of all you can’t even believe that all the ingredients used are low fat. I was a little bit worried if the cake would set as I used yoghurt and less eggs and I was also worried if the jelly topping would turn out to be too sweet, but it was absolutely perfect. The only thing that I would change if I made it again, would be to use a smaller baking tin to make it higher but unfortunately, the only springform pan I now have is an 11″ (28 cm) one. I met Rosie in the early states of Blogging and her blog was then called Baking a Peace of Cake. She was a caring person, always left kind comments at my posts, we exchanged Awards of friendship and participated in most of the events I created and I also participated in a few she hosted as well, so as years passed we became quite close. She was a very caring and loving person. I just wanted to send you a quick email to let you know I’ve been trying to comment on your blog but my web browser Internet Explorer will not open up your page fully and keeps putting a box up with a red x which says operation aborted. I do know this was happening on my blog last week and found out it was the followers widget playing up in the end. I didn’t want you to think I’d forgotten you!! During this exchange of e-mails we also talked about some personal things, especially relating to health. Goodbye my friend. May you R.I.P. I will miss you. Please my friends, change you cooking habits and enjoy food, eating healthier but still even if you can’t change your habits, I believe that we can enjoy all things good, if we practice moderation. This apricot cheesecake is extremely creamy and smooth. It has much less calories than a regular cheesecake but with all the creamy taste! Blanche almonds and roast until until light tan and fragrant, 12 to 15 minutes. . Allow to cool. Melt chocolate in a double boiler and set aside to cool. Put the almonds in the food processor and powder. Add half biscuits, or as many as can fit in the food processor and powder. Add the remaining biscuits and tahini and pulse together. Empty in a 26 cm spring form baking tin, add the butter and mix to combine. Press into the bottom of the pan. Bake for ten minutes and set aside. In the same food processor (no need to wash) add apricot fruit preserve and mix to puree. Add anthotyro cheese and mix. In the mixer bowl beat the eggs, add the cream cheese and yoghurt and beat until fluffy. Add the apricot-cheese mixture, the vanilla and mix to combine. Pour the cream cheese mixture evenly over prepared crust reserving about 4 heaped tablespoons, which mix with the melted chocolate. Fill a pastry bag with this mixture and make small balls in the other cream mixture. Preheat oven to 180 degrees C. Wrap the cake pan with aluminium foil and bake in a water bath for about 45 – 60 minutes or until it sets. While cooling prepare the jelly. Put the gelatine leaves in a bowl with cold water for 2 - 3 minutes, to soften. In a food processor put the apricot preserve with some syrup and puree. Heat the water and add the gelatin leaves. Mix until they dissolve. Add the Apricots and gelatin in a bowl, mix and set aside to cool. 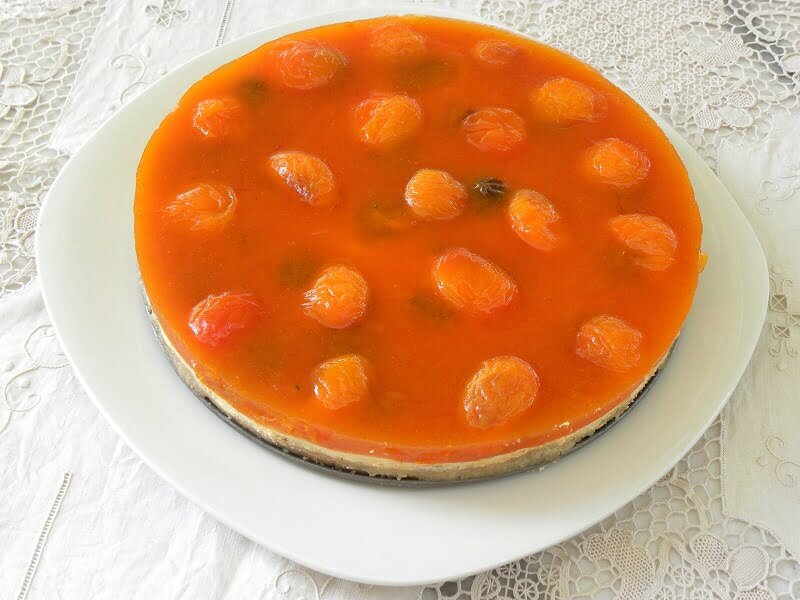 Using a spoon, carefully add the jelly on top of the cheesecake and decorate with the apricot halves. Refrigerate for a few hours, until it sets and remove the ring of the pan. Wow, that was a lot of calories! This light version looks fantastic. A lovely cheesecake! This is indeed a guilt free apricot cheese cake. Nice color. I am sure it taste good too. A beautiful and healthy dessert and what a wonderful tribute to Rosie! wonderful light version for cheesecake! Beautiful cheesecake looks truly tempting…thanks for sharing this low fat version..
A happy and healthy birthday to your husband Ivy! Na ton xairesai … ekatohronos. As for this cheesecake it looks quite good regardless of the healthy adjustments … it looks just as delicious as any regular cheesecake … perhaps even better actually! Rosie was a lovely person and I know she is in a better place. Thank you Maria for your wishes. Lovely post and thank you for the info!! !That dessert looks amazing and sounds healthy,Ivy! This turned out wonderful Ivy with all of your substitutions! You did a great job of making it healthier. I bet it was delicious! Hi Ivy, I've been following your blog and your Mediterranean diet for a few weeks now and wanted to share some insight with you. Recently I made your Mahalepi pudding dessert which I found truly delicious! What I did differently though was I reduced the sugar in your recipe by half. Like you, I've also been trying to cut back on unnecessary calories and have found that eliminating refined or processed sugars can really make a difference in weight loss. One diet I've been a devout follower of is the South Beach Diet. It worked wonders for me once I stopped eating white carbohydrates like white rice, pasta, bread, potatoes and of course sugar. One thing I would do differently with this cheesecake, which by the way looks amazing, is replace the sweetened fruit with fresh fruit. This small change would further reduce the calorie count of the dessert. Anyway, I just wanted to share my approach to weight loss with you. Thanks and keep up the great cooking! Welcome and thank you for taking time to write you views on this matter. I can't disagree with you regarding sugar but I mostly make the desserts for my children who always complain that my desserts are not sweet enough. Actually mahalebi is without sugar at all and you just sweeten it with what you add on top. Regarding the cheesecake, I also agree with you but you must have in mind that I am a house cook and I use whatever ingredients I have at home. I made an apricot spoon sweet last week and because the apricots were very ripe they mashed so I had to use them. I have already made a pannacotta using them and now this cheesecake. I still have some more and I am definitely not going to through it away. Using fresh fruit is a good idea and I could have used strawberries or cherries, which are in abundance this time of the year, as I have done in other recipes in the past . I don't think that this cheesecake would be good using fresh apricots and what gives flavour to the cheesecake is the cooked fruit. The only thing I would change if I would make it again I would still make the apricots into a compote using less sugar. However, it still needs something to sweeten the cream as well. If I didn't have the spoon sweet I would have probably used honey instead. Thank you for your response Ivy. When I mentioned that I reduced the sugar in the Mahalepi, I meant the "fructose" which is a form of sugar. I used 2 tbs instead of 5 tbs. I love sweets and was once addicted to sugar, which is why I try to avoid it now. I really appreciate your innovative approach to adjusting your recipes to accommodate your family. I do this all the time too. It makes perfect sense to sweeten things up for your kids and to also use what you have on hand at home. Coming from a household with diabetics, I just avoid sweeteners. I've had my eye on your delicious looking Pana cotta recipe and will most likely try that out next. Cheers! You are welcome Joanne and I get your point. Best wishes for your husband’s birthday Ivy…I love how you are getting around recipes and adjusting them to make them healthier…this cheesecake looks brilliant! thanks for sharing so much info and for such an incredible healthy cheesecake! The apricot topping just sings to me! Welcome Chef Dennis and thanks for leaving your comment. It's an honour meeting you. That looks refreshing, it seems very light, considering it is cheesecake. I'm with you about eating healthier now a days or eating in moderation. You can't probably deny yourself with good stuff such as cheesecake, but moderation is always the key. It's so nice to find a healthier version of cheesecake (I'm a self confessed cheesecake fan!) I will definitely try this one. Thanks for sharing this. You're right though, it'll probably look even better when it's thicker. A smaller pan it is then! Thanks very much for passing by and leaving a comment. Ivy mon amie, un seul mot : MAGNIFIQUE! Je n'en aurai bien pris une tranche pour le plaisir de déguster. A la mémoire de Rosie. I have been trying to leave comments on your site to no avail! I am touched by the tribute to your friend and enamored with that magnificent cheesecake! Apricots and creamy cheese what could be better? thanks a million for leaving a link on how to preserve grape leaves! Much needed and appreciated. Thanks Joumana. Glad you could post a comment. I'll have to see what's the problem as I've got some e-mails from friends telling me that they can't comment. Your cheesecake looks so lovely with the apricots and jelly on top! The chocolate in it sounds delicious too. It's so thoughtful of you to honor your friend. looks deliciously healthy! thanks for the recipe! What a fab recipe Ivy. I adore cheesecake, but don’t really know how to make it healthier – so I will have to give this a go. Low fat or not, it looks delicious! I almost always use low fat cream cheese in anything that calls for it – can't tell the difference. Xprovia polla ston andra sou!